The Korean Ethnic Minority is the 13Th Largest Ethnic Minority Group in China (P.R.C.). In 1949 AD, immediately after the establishment of the Peoples Republic of China the Yanbian Korean Ethnic Minority University was created in Jilin Province. It was the first such Ethnic University to be established in the Nation. 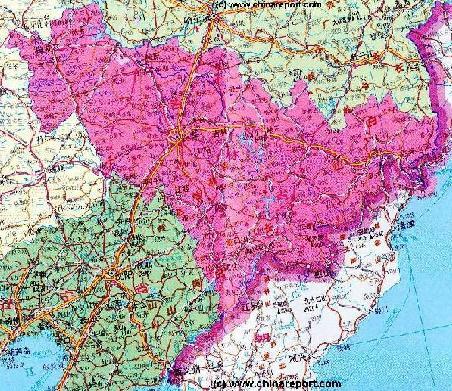 Not much later, in 1952 AD during the establishment of a National Ethnic Minority Protection Plan the new Chinese government gave Koreans their own autonomous region in North-East Jilin Province on the Border with North-Korea. This Area, Yanbian was upgraded into an ethnic autonomous prefecture, the Yanbian Korean Autonomous Prefecture in 1955 AD. Yanbian Korean Autonomous Prefecture, or Yanbian ChaoXianzu ZizhiZhou, measures 42,700 square kilometers (16,500 square miles - or roughly 45% of the Size of South Korea) and is located in the far North-Eastern Corner of Jilin Province where it borders on both Primorsky Krai of the Russian Federation and North Hamgyong Province (Hamgyong Bukto) of North Korea (D.P.R.K.). To the North and West lies the Russian controlled area of Primorsky Krai with the nearby Port City of Vladivostok. Yanbian Prefecture is administratively subdivided into 6 county level cities and two rural counties. The "cities" (Counties) of Yanbian Prefecture are: Yanji City - The Capital and its County, followed by Dunhua City and County, Helong City and County, Longjing City and its County, Tumen City and County and finally Hunchun City and its County. territory within the Yanbian Prefecture where so fa few venture. Connected to the Capital Yanji via a railroad, the Wangqing County is famous for its Gaya River and Manchu and Korean ethnic villages. The border region here is formed naturally by the southern slopes of the Sikhote-Alin mountainous formation of which most territory is mountainous and consists for 80% of forested highlands (The Sikhote-Alin Mountains were the scene of a historic meteor explosion in 1947 AD). As can be seen on adjacent maps, the easternmost population center in the prefecture is Fangchuan, an attraction only because of its remote location in view of both the Russian and North-Korean Borders. 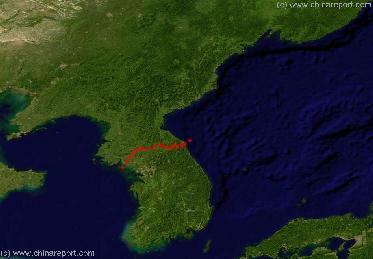 From Fangchuan it is still some 17 kilometers to the Sea of Japan, all of which currently is North-Korean Territory. Yanbian Prefecture, Jilin Province and China are therefor landlocked in this strategic far North-Eastern Corner. A Satellite Image of the Korean Peninsula and Parts of China's North-Eastern Liaoning and Jilin Provinces giving a rough idea of local borders and towns. - Mouse over Image to reveal the location of Yanbian Korean Autonomous Prefecture ! 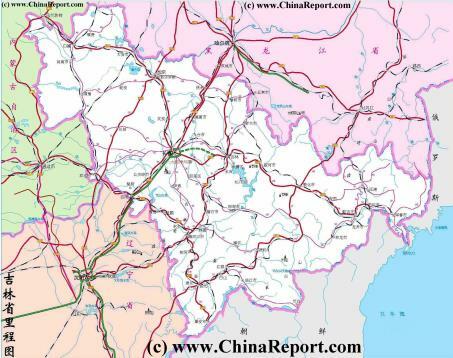 Overview Map of Jilin Province and bordering area's clearly depicting the Yanbian Korean Autonomous Prefecture plus main cities and towns as well as the main highway to Yan'Ji and Hunchun. 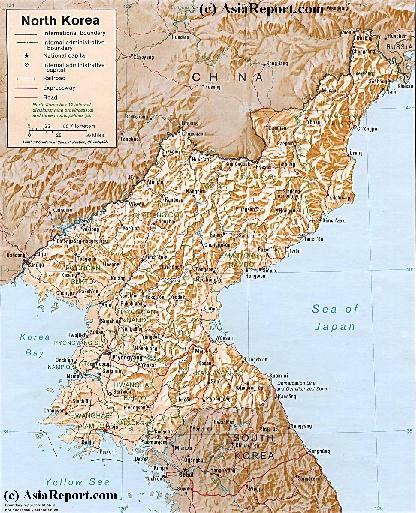 A Satellite Image based Map of the the North-Eastern (Manchuria) Chinese Province of Jilin (with parts of Liaoning Province), the Chinese-North Korean Border, Part of Russian Primorsky Krai (Maritime) Province of Siberia in the Russian Federation, and the Nations of North Korea (DPRK) and South Korea (DRK) on the Korean Peninsula. - MOUSE OVER IMAGE ! Furthermore, the Korean Prefecture lies due North-East of Changbai Shan Reserve, another area popular for South-Korean Tourists due to the fact that for the Koreans, Mount Paektu is a holy place entwined with their earliest history. According to popular Korean legend, the heavenly God Hwanung (“the king come from the sky”) landed on the volcano to couple (?!) with a woman who then conceived a son, Tangun (“the king of the birch-tree”(Birch Trees are abundant throughout Manchuria)), who in 2333 B.C. founded the Kingdom of Choson, which is regarded as being the first Korean state in history. The first reason for the popularity of Yanbian Korean Prefecture as a tourist destination for (South) Korean visitors is that it is the location of important Balhae archaeological site (an ancient Korean Kingdom that existed during the Tang Dynasty Era in the Manchurian and Korean regions) known as the Ancient Tombs at Longtou Mountain, which includes the Mausoleum of Princess Zhenxiao. This ancient Kingdom play a very important role in Korean Nationalism leading to continued public interest. Many Korean tourists visit this site each summer season. found in the further Korean myth that has been created by the North Korean Communist propaganda machine, a myth that holds that the 2nd Communist Korean Leader Kim Yong-Il, son of the founding father rebel leader Kim Il-Song (who died in December 2011), was supposedly born in this snow-covered, rough and pristine mountain area. 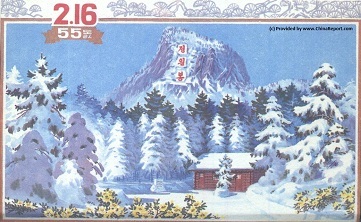 Currently, in 2013 the North Korean side of the mauntain holds a life-sized copy of that cabin, as depicted on the old North Korean holiday postcard adjacent. city is home to large detention center for North Koreans awaiting repatriation to their homeland. In addition to the cargo link to North Korea, a new railway line was constructed to link Hunchun and Russian Port Cities immediately to the North in Russian Primorsky Krai (Maritime Province). Since the year 2000 AD Hunchun connects by railway to Makhalino, a station on the Ussuriysk-Khasan line, 41 km before Khasan in Russia. From this point trains can connect to Posyet (42Km) or Zarubino 63 Km) port towns of Russia on the Sea of Japan Coast. Historically, the Yanbian Prefecture consisted mainly of remote agricultural communities engaged in small scale farming, especially rice farming. However, ever since the Cultural Revolution Era and more recently with China's economic boom in the 1990's, Yanbian has started to follow the path of Industrialization. In 1992 AD, the small port city of Hunchun was chosen as the location of Hunchun Border Economic Cooperation Zone service between Hunchun and the North Korean port town of Rajin crossing the border via the Tumen-Namyang bridge. This container link is now part of a thriving cross-border trade between both Nations and a vital economic lifeline for North Korea. Although political disagreements between China and North Korea as well as United Nations sanctions and pressure have halted traffic across the Tumen Bridge several times, on average there is a regular cargo service bringing in vital goods and fuel for the North Korean Government. main remaining border dispute between the Chinese Government and North Korea concerns Mount Paektu , the mountain at the center of the Changbai Shan Nature Reserve. As a result, the precise border in this area has not been clarified as of yet. Song "Arirang". Arranged by Steve Jablonski. 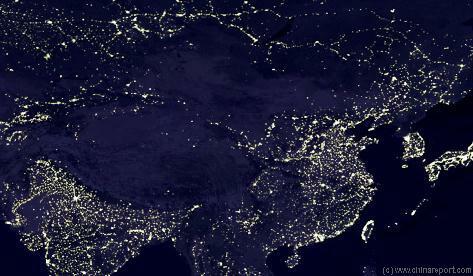 A Satellite Image Overview of The Peoples Republic of China (and wider Regions) at Night. 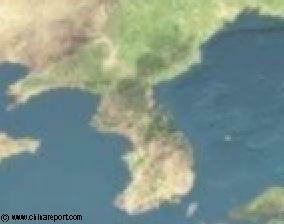 Clearly visible is the black hole formed by North Korea, just across the border from Dandong in Liaoning Province. Five Cities are visible inside North Korea (DPRK) of which only two clearly: Pyongyang the Capital, and the Northern Coastal City of Ch'Ongjin. - Click Image to go to Full Version with Cities + Explanation. (http://twitter.com/asiareportcom) for near LIVE Reporting by DrBen & China Report Staff & their Mobile Devices (ChinaReportcom2 & ChinaReportcom3). Geographic overview Map of North Korea (DPRK), and parts of Jilin Province and Yanbian Korean Autonomous Prefecture. smaller ethnic villages are often located remotely between the fields on hills and can be hard to reach in winter or in the rainy season as they are only accesible via mud roads and tracks. In winters thick snows blanket the hills making movement difficult. In the rainy season mud roads between remote villages become pond lined tracks and travel is best done by motorcycle or on foot. Read More in: "History of Yanji (and Yanbian)". 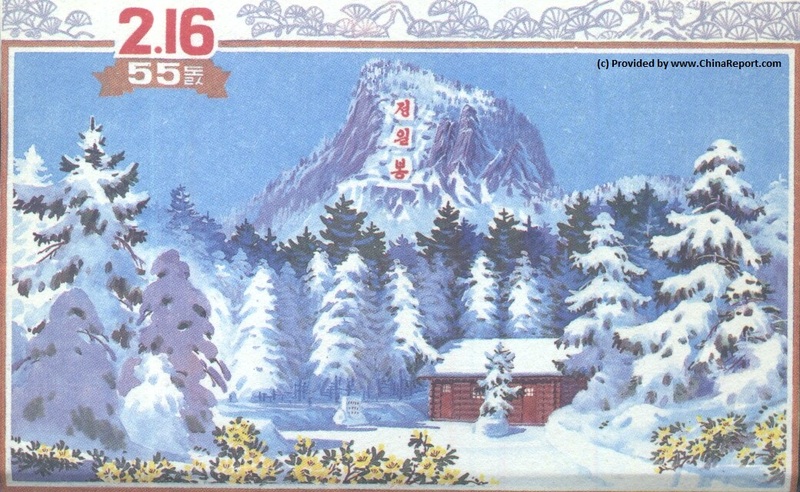 North Korean Postcard depicting the snowcapped Changbai Shan holy mountain and the scene of the birthplace of Kim Yong-Il, the now deceased Leader and Son of founding Father Kim Il-Song. 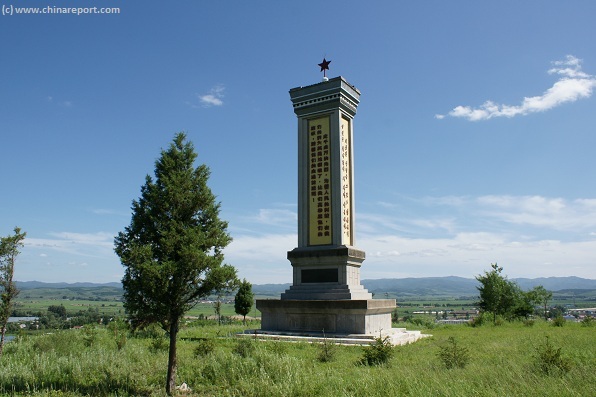 revolution”, the place of the most important guerrilla exploits in the 1930s under the command of Kim Il-Sung. 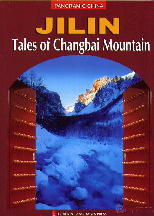 The claims have a highly symbolic meaning as the name of the Mountain Reverberates through Korean History. Read More in: "Time-Line History of Korea 1910 to 2011 (in 5 Parts)"
citizens, the city is currently expanding and seeing an influx of new citizens moving away from a rural small scale farming lifestyle in the surrounding area's. There is also a growing cross-border trade with Russia and Korea bringing in foreign inhabitants. The main sites of interest within Yanji City are currently its recently enlarged Christian Church, the open market along the Yanhe (He = River), its small Zoo or better Animal Park , the Yanji Park and the Along river that flows through town. There is river walkway that serves as the main focus of entertainment in town summer, but little else. A trip to Tumen and the possibility to look into North Korea are the fourth most important reason for tourists to travel to Yanbian Prefecture. To get down to the border at Tumen travel through the city of Yanji is nearly obligatory and today it is possible to travel from Yanji to Tumen by Bus as well as train, and many more travel their with their very own tourbus and group. After making the relatively short trip of about one hour into increasingly mountainous terrain, one can make ones way through the small town to the banks of the Tumen River which winds it way through the mountains forming the border with the Democratic Peoples Republic of Korea a.k.a. North Korea. Across from Tumen lies the seemingly nearly abandoned North Korean town of Namyang, which can be scrutinized from the safety of China on the western side of the River. 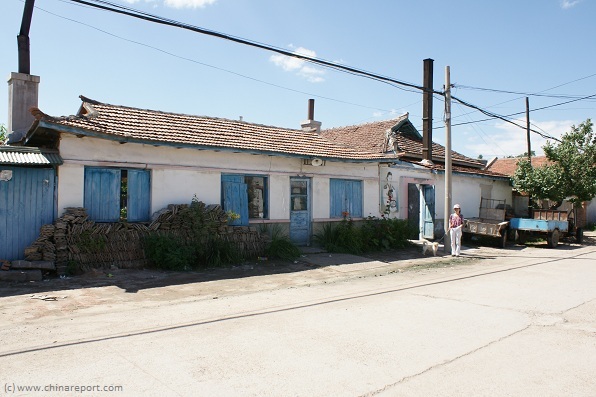 Although the village lives up to expectations and is as drab as befits such a place, there is not very much to see. That is, behind Namyang rises another mountain ridge, which keeps visitors from seeing beyond and catching more glimpses of North Korean Life. A Look from China into North-Korea - most reclusive nation in the world - across the Tumen-Namyang Sino-Korean Friendship Bridge, a legendary and vital connection between the two nations. 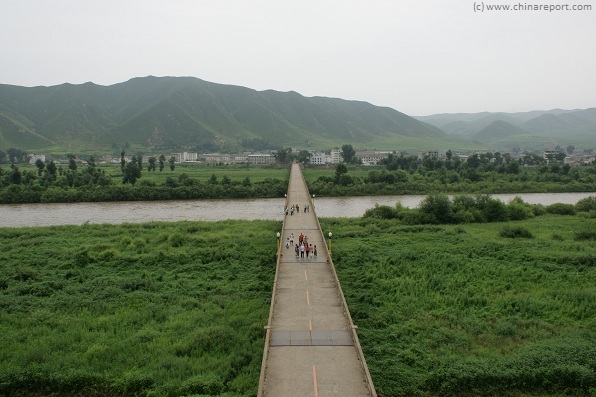 Chinese tourists stand on the bridge, in the distance on the other side; Namyang, the North Korean border town. (Photo (c) DrBen.Net : August 2010). the village of Namyang. In between the Tumen River, not very impressive even in the rainy season in Juli and August, shapes the border and offers the opportunity for a boat-ride and an even closer look. Browse along the miles long river walkway and visit both the Tumen-Namyang friendship bridge, and walk on to the recently upgraded railroad bridge which serves as a vital economic artery for the ailing DPRK. Foreign visitors are not allowed to walk on the Tumen-Namyang friendship- and border-bridge, but Chinese tourists may walk right up to the border line drawn in white halfway the bridge. Only occasionally traffic crosses the bridge from North Korea into China (P.R.C.) and vice versa. 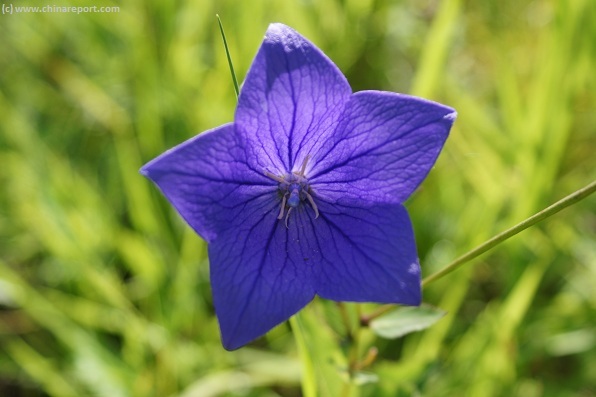 The Fifth, last and probably most under-appreciated reason for visiting Yanbian Korean Autonomous Prefecture and the regions surrounding its Capital Yanji city is their abundance in natural beauties. As one of the less explored and developed regions of the Nation Yanbian can boast a considerable rural charm, pristine forests (among which Changbai Shan Reserve is the largest), green hills and farmlands, and a wide variety of animal and insect species. For those seeking a getaway from smokey, dusty, misty, overcrowded, hot or moist regions in China can find a perfect getaway uphere in the North. There are not too many visitors. To find the real Korean communities, head out into the countryside and get your feet dirty. Read and see more in the Yanji Report section and Tumen Report sections of this website. Solemn Martyr's Monument of the Korean War on a hill overlooking the Korean town of Tudao, named after its potato market. (Photo: July 2010). of the North Korean State. Suffering countless casualties among whom Mao Zedong's very own son Mao Anying (毛岸英), in the end they succeeded in bringing the conflict to a stalemate long after regular North Korean Forces were effectively defeated. The war did not officially end, but led to an armistice which still holds today in the year 2011. Although historic witness accounts from Russia (former Soviet Union, C.C.C.P.) have disclosed that the North Korean Leadership was exhausted and ready to end the war already in 1952, the Korean armistice only came about after Mao Zedong had agreed to it, not the Korean Leader Kim Il-Song. The reasons Mao had for agreeing did not even have much to do with Korea, but rather with his relationship with the Soviet Union and its Dictatorial Soviet Leader Joseph Stalin. Mao Zedong had been using the Korean conflict and the threat of an American Invasion to pressure the Soviet Union into delivering the technology to build a nuclear bomb. When after long considerations, the Russians declined to deliver, the expense of the Korean War was no longer politically useful and the conflict was ended the very next day. It remains among the living legacies of Mao Zedong. Although hardly mentioned in China today, due to the overwhelming fire-power deployed against the waves of Chinese infantrymen, many sons of Yanbian did not return to their native villages and the Chinese people paid a very high price for their help to their neighbor nation. Apart from the deaths on the battle field proper, large scale bombing by the American airforce caused more death and destruction on the Chinese side of the border along the main supply routes running through Dandong in Liaoning Province and Tumen-Namyang in Jilin Province. Today, nearly each village, no matter how small has its own memorial stele dedicated to those lost in that period. 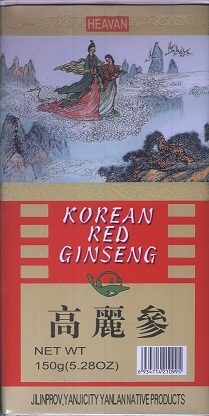 Among the local herbs, Korean Red Ginseng, which is grown locally but also imported from the Democratic Peoples Republic of Korea. It is one of the few products North Korea can deliver in large quantities. (Photo: July 2010). An specimen of the Jilin Province National Flower, an plant with herbal and medicinal qualities. (Photo: July 2010). Yanbian is bordered by the rough terrain of the Changbai Shan Mountain Reserve which includes several peaks in the South, the forbidden territory of the Democratic Peoples Republic of Korea (DPRK) in the South-East, the Russian Federation in the North-East and the Province of Heilongjiang in the North. Located far away from the most important city in the Province, the provincial Capital of Changchun, Yanbian is situated in the most remote corner of Jilin Province. 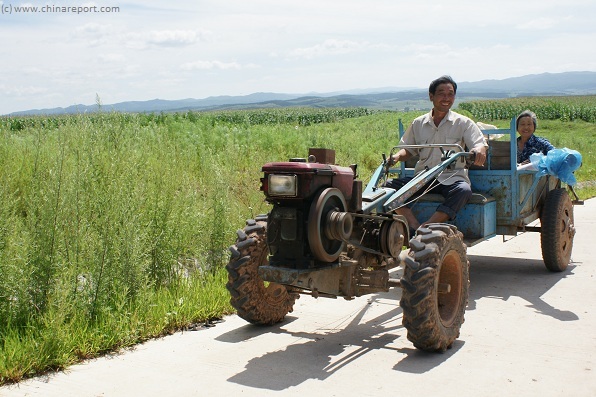 Therefor, transport from any location in China to Yanbian Prefecture used to be a time consuming and arduous business. Today the situation has been much improved, mainly to the large growth in domestic airtravel and direct flights into Yanji Chaoyangchuan (National) Airport, among things from Beijing. The most important railway connection in the region is the Chinese Branch of the trans-Siberian railway historically known as the Manchurian Railway. This still vital railway link was the first established railway line in the regions, connecting Russia with China (P.R.C.) and the previously ultra-remote cities of Haerbin, Changchun and Shenyang with the rest of the Chinese Nation, laying among things the logistic base for the later industrialization of North-East China. Growing into large cities along the railway line, Shengyang and Changchun plus surrounding cities became the most popular civilization centers in the region, whereas everything East of the main railway in Jilin was less developed. To a large extend this situation remains today, among things due to the extremes of the climate in the regions and furthermore because of the non-existence of cross-border trade with the economically inactive neighbor of North Korea (DPRK). The Yanbian cow is a special breed, native to this region but exported throughout northern China for use in the special circumstances and climate of the region. Yanbian cattle, as the sub-species are known, today are distributed throughout north- and north-east China, and are adapted to dry regions with large yearly changes in temperature. 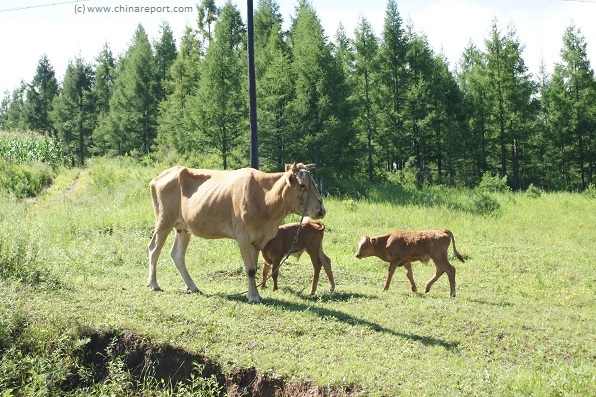 Mature Yanbian cows are much taller and heavier than Mongolian and Kazakh Cows found in other northern regions of China (The females have an average wither height of 122 cm and body weight of 365 kg). The Yanbian Cattle are identified as THE cattle asociated with the Korean ethnic minority in China but are also found in other Provinces such as Heilongjiang Province, and in Liaoning Province in the south, especially the autonomous prefectures in the east of Liaoning Province where Korean minorities make their homes as well. Yanbian cattle are not used on the farms for producing milk, but mainly serve as the main powersource for working the difficult and muddy lands. They are rarely slaughtered on farms, and very prized animals. A Yanbian Cow with two calfs grazing among fields and forest near a small scale farm on a hillside, south-east of Yanji City in Yanbian Korean Autonomous Prefecture. by small roads and many more mudpaths criss-crossing the hillsides, they form the core of the Korean communities for which the Prefecture is renowned. Reaching them often requires getting off the beaten path, or getting the feet dirty but once out among the farms a new kind of Yanbian expresses itself to the visitor. There are no tall buildings or roaring engine noises, fields and green hills stretch as far as the eye can see and among the fields and forests are many flowers and butterflies. The villages themselves are small and often have recently built housing. True Korean architecture in the old style, built of mud and brick is fast disappearing as farmers enjoy a higher standard of living. Villages in the valleys have often grown into larger towns with a market place. The larger towns and cities of Yanbian and Jilin Province are today the locations where a building boom and expansions are underway as Chinese citizens, including those in Yanbian are moving from their small scale farms where they lived impoverished lives, to the city in the hope of a better richer future. A typical small village of Yanbian Korean Autonomous Prefecture consisting of a few farms and households living grouped together. (Photo: July 2010). nation, by various methods such as increasing mechanized farming (where possible), introducing more scientific methods of farming and overal by raising the yearly incomes of local farmers. Local industries are often related to either construction or agricultural production. A noteworthy jewel in the crown of Yanbian is the Yanbian Chunlei Biochemical Reagent Co., Ltd., which is a locally established company researching, developing and marketing the agricultural biological bactericide. First established as early as the year 1972 it was one of the earliest corporation producing biological pesticide in China entire. Today it produces such substances as Polyoxin, Kasugamycin, Daojie, Lieshuang, all of which are safe, effective, low residue biological pesticides. According to the companies advertizements and sales rap these can not only prevent the germ on agricultural crops such as vegetables, tobacco, Chinese traditional medicines, grain, cotton, and tea, but also have a remarkable effect in stimulating the crop’s growth, owing to the various nutrients inside them. Naturally, the presence of the company is welcome in an overwhelmingly agricultural region where skilled jobs are sparse and literally far between. A brain-textured round mushroom used to make anti-septic bandages and stop bleeding. (Photo: July 2010). A large butterfly found among brush and corn fields in Yanbian Korean Autonomous Prefecture of China. (Photo: July 2010). Villages are typically small, often around 8 to 10 houses only, lying dispersed along the hillsides and farmlands of the wider region. They are secluded places, close-knit communities that see no foreign or even oustide visitors and where everyone knows each member of every household in the wider area. The villages are led by political commisars of the Communist Party, mainly the village head, a person who must be a communist party member but is further elected democractically by all citizens of the village together. Although the drastic changes that are sweeping China certainly do not leave Yanbian Prefecture untouched but have altered life in its capital city as well as the wider regions, agriculture remains a very important pillar of the local economy throughout the prefecture. In fact, most non-city dwellers are small scale farmers who are directly dependent on the local produce for their jobs and sustainance. Much farmed crops are corn and millet, tobacco, as well as the earlier mentioned rice. Rice production in the north however has been scaled back due to the requirement of enough water as well as the labor intensity of the farming process. Other local products are many, too many to mention in fact. 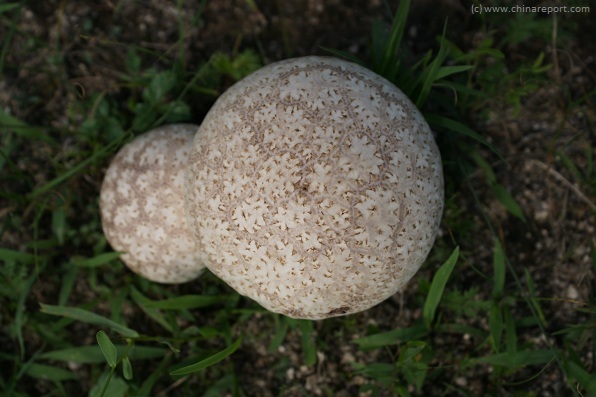 Among the most noteworthy, a large variety of mushrooms, medicinal herbs, original Korean Red Ginseng and the beloved Chinese Cabbage for making the spicy and fermented Korean dish of Kimchi. As for local farms, until fairly recently these were small mud-walled huts covered by straw or reed roofings. Only after China's entry into the WTO and the continuing economic boom of the last decenium have farmers been able to replace their mud huts with more solid brick buildings. The cows of Yanbian are often still used as work animals, as mechanized working of the fields is difficult and often clumsy work on the failry steep and muddy hillsides of the region. Other farms animals include geese, chickens, dogs for guard duty, cats to catch mice and rats, pigs as the main source of meat on the farm and ducks for eggs and meat. An ethnic Korean (Chaoxian) Family of restaurant owners in the agricultural market Town of Tudao (zhen) in Yanbian Korean Autonomous Prefecture. (Photo: July 2010). Although the region has a long history of inhabitation, the land was first inhabited by what today are counted as Korean tribes and in later periods contested by Han Chinese, the Khitans and their descendents the Manchu's who later founded the Qing Dynasty and in the 19Th and 20Th century the Russians and Japanese. 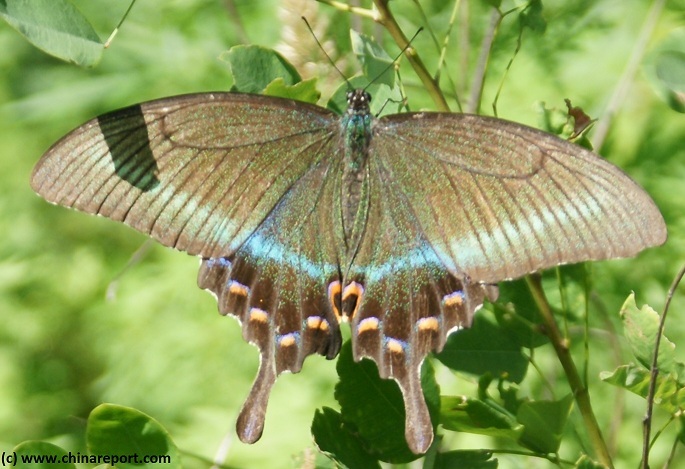 Until fairly recently though, what is currently Yanbian Korean Prefecture was but a sparsely inhabited region, thickly covered by forests and inhabited by such wild animals as the wolf, species of bear and even the magnificent Manchurian tiger. The first real development of the regions only occurred late in the 19Th Century and in the first decennia of the 20Th century when the Russian Empire reached the far east, building what is today famous worldwide as the trans-Siberian railway. The trans-Siberian railway has a branch into north-eastern China, leading via Changchun in Jilin to Shenyang in Liaoning Province, the railways in the east seeding the first beginnings of towns and later industrialized cities along the railways. Overall though, the Regions were uninhabited, mainly traversed by hunters, cross border traders and in some places inhabited by small scale farmers. The rest was mountains and forrests frozen in winter and filled with mosquitos and bogs in summer. Due to the roughed climate and temperatures of minus 40 Celsius in winter, no one really wanted to hold out that far up north. Although the first Japanese invasions of the Korean Peninsula, which extends to the south from Yanbian and the Tumen River, already occurred in the 16Th Century (1592 AD - 1598 AD), a new Japanese invasion occurred at the end of the 19Th Century, drastically altering the situation in Eastern Asia, including the secluded and remote Yanbian Prefecture. Only after the end of the Korean War in August of 1953 could the people of Yanbian finally look to a more peaceful future and start the rebuilding of lives and households. It was in this significant period of optimism and development that the Province of Jilin, and especially the new Yanbian Korean Autonomous Prefecture (finalized in 1955), saw a new influx of migrants. Not only did the newly founded Peoples Republic of China desire to mass redistribute land to its many impoverished farming citizens, in the years following the initial establishment of the Peoples Republic the nation faced a problem of overpopulation. In the case of the Korean enclave of Yanbian the Chinese State also faced a further problem, namely how to retain Chinese sovereignty over a disputed peace of land, which - although one of the most trustable communist bases of the revolutionary war- knew an overwhelmingly ethnic Korean (Chaoxian) population of 62%. In attempt to solve all three problems with one bold stroke, many poor Han Chinese farmers were relocated from overpopulated Provinces (mainly Shandong Province and Anhui Province) and given large plots of land to develop for themselves within Jilin Province and Yanbian Korean Autonomous Prefecture. Example of traditional Korean architectural style in Tudaozhen, market Town in Yanbian Korean Autonomous Prefecture of China. The most striking differences with a Chinese Home are the roof style, form and decorations (Photo: July 2010). with the Korean Families, in the following years slowly assimilating with them and adopting many elements of Korean ethnic culture. Han Chinese farmers in the region adopted Korean farming methods including the farming of specific grains of rice that were able to withstand the cold climate of winter in Manchuria. They also adopted Korean cooking styles and other tastes. Although traditional life is fading all over China, even today, as citizens of Yanbian Korean Autonomous Prefecture, Han Chinese Girls are following Korean language lessons in Yanbian, and at traditional festivals they dress up in traditional Korean Dress. Official delegates from Yanbian Prefecture to the National Peoples Consultative Conference, an advisory organ of the ruling Communist Party Government, usually dress in Korean Style when visiting the NPCC Opening Ceremonies at the Great Hall of the Peoples at Tian 'An Men Square in Beijing. Not much can be told about Yanbian Prefecture in the period between its establishment in 1955 and today. Probably due to the fact that the entire Yanbian Prefecture was declared an off-limits zone for Foreigners (Beginning and end of period unknown but likely at some time in the 1980's) there were no major incidents, accidents, war or other woes reported from the area well into the 1980's. Even today the Yanbian Prefecture is considered a remote corner of the Nation, and only some Christian NGO's, Churches and News Agencies keep an eye it. While Yanbian was closed off from the outside world, as was most of China (P.R.C.) until well after 1976 AD, the "hidden" conflict between China and Korea over the territory of Yanbian continued. The essence of this conflict lies in the Korean view (which is historically well supported) that before the Chinese civilization arrived in the regions, this region was Governed by what is recognized by the North- and South Koreans alike as early Korean Kingdoms. These Kingdoms, in succession Koguryo (Hangul: 고구려; Hanja: 高句麗) and Balhae (Hangul: 발해, Chinese: Bohai [渤海], Russian: Бохай or Пархэ) ruled almost uninterupted over Yanbian, the wider regions and on the Korean Peninsula for around a 1000 years since 37 B.C. True, the Koguryeo Kingdom was destroyed in the year 668 AD by its counterpart Silla with help of the Chinese Tang Dynasty (618 AD - 907 AD), however when the Chinese lost control of their northern territories (at the hands of the Khitans who were neighbors of Koguryeo and Balhae) the previous situation was quickly restored (by and large). Even after the fall of Balhae in 926 A.D. Chinese control of the regions did not occur until long after and China's claims to lands on the Korean Peninsula date from centuries later. It was not until the Manchu Qing Dynasty invaded China that "Chinese" territories suddenly included anything such. (The territory should have been regarded as part of Manchuria, which was certainly by the members of the Qing Dynastic House themselves regarded an independent Nation and State, which was not a historic part of China but of Manchuria (Manchukou)). At least, that is how most of today's historians and most Koreans would regard the accounts of history. However, on the other hand: factually, the Peoples Republic of China, established in 1949 AD, had its very own reasons and justifications to claim the lands. In its view, under the Manchu Qing Dynasty, before aggressive Foreigners (other than the Manchu) arrived, all of Manchuria was part of the larger Chinese State of Qing China (The Manchu Qing Dynasty which ruled all but in thought still divided between Manchuria and China) and therefor, its successor State whether it be Kuomindang or Communist could lay a claim to the Qing Territory and also Yanbian (Now Prefecture). As historic events have led to a practical situation in which China (P.R.C.) were the first who could reinforce their claims (taking all of North China and Manchuria in 1947/48 AD before the re-establishment of any Korean State) the Manchurian Regions have since been under China's control. (Read More of the history of Yanbian Prefecture and the wider regions in: "History of Yanji (and Yanbian)"). As was described, one of the tactics used by the Peoples Republic was to slowly but steadily infuse the Yanbian Korean "Province" (as South Koreans like to see it) with Han Chinese migrants, whereas at the time Koreans could but look on in pain, keeping an eye on the "Province" of Yanbian while spreading their propaganda and viewpoints on the matter. Although the new Chinese State was certain of its territorial claims, at the time in the 1950's there were serious historical debts to the Korean People, not only for their very active help in establishing Communist Rule in Manchuria and North China, but also for Korean contributions in the Chinese Civil War, among things during the Battle for Hainan Island (Province) in the South China Sea, which took place in the spring of 1950. As may be obvious, mutual ties were further reinforced (and also strained) during the subseqently ensuing Korean War (1950 AD - 1953 AD) leaving Yanbian behind a black out screen and complicating the Sino-Korean relationship significantly. In short, China could not entirely ignore its smaller but zealous neighbors the Koreans with their ardent Nationalism. Therefor, probably to appease the situation (but in line with National Policies), in 1955 AD the "Korean Province" of Yanbian was made an official "Korean Autonomous Region" of the Peoples Republic, granting the Yanbian Region nominal autonomy. In reality of course, nothing of the kind would actually be made into practice, and as in other "ethnic autonomous regions" in the newly arisen People's Republic of Mao Zedong, the region was put on tight political leash, being carefully monitored and guided by the strong hands of the Communist Party Government in Beijing. As we know today, as with Tibet and Xinjiang, the Korean Region of Yanbian especially had the attention of the highest ranks of the Party Government. "Changchun - Northern City of Eternal Spring"
Farmers couple traveling back from the market in town using their small tractor. (Photo: July 2010). After the lengthy anti-Japanese struggle, which was ended in August of 1945 AD, and the subsequent woes of the second Chinese Civil War (period), China and Yanbian Prefecture did not see a real period peace and quiet before in July of 1950 already, the Korean War broke out on the peninsula again bringing the drums of war. That is, during the final stages of the Chinese Civil War Korean men from Yanbian and beyond fought alongside the troops of the Chinese Communist Party in a their succesful attempt to secure all of north China within their hold. Shortly thereafter (North) Korean men and farmers sons from Yanbian took part in the final Battle for the island of Hainan (Hainan Dao Province) in South China which took place in the spring of the year 1950 (Official date Hainan Landings: March 5, 1950 - May 1, 1950). Thus, although the rest of the world may enjoy its newfound peace for many men in Yanbian and North Korea the war never ended and many were battle hardened veterans upon their return home. Soon after they were thrown into battle again as North Korean troops silently supported by both Russia and China rolled into South Korean territory in a bid to overthrow its weaker neighbor. As is well known, thereafter mostly American Troops were the only ones to stand between the so called DMZ and the southern port city of Pusan in the ROK. The initial war almost became a North Korean victory until the tide turned at the end of the summer of 1950. 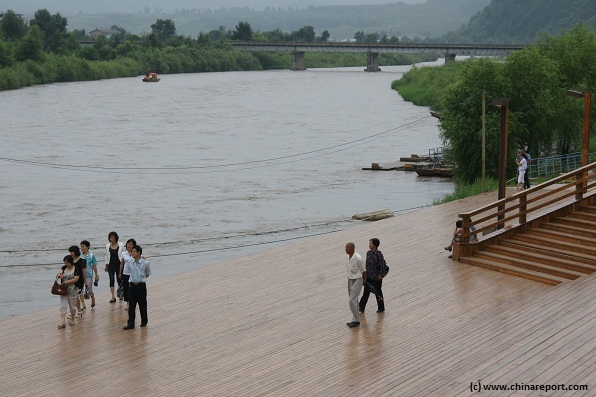 Tourists can come to Tumen City to make a walk along the Tumen River and view the vital Tumen-Namyang Sino-Korean friendship bridge, a historic bridge that once more gained importance in recent years as vital conduit of cargo bound for the internationally shunned and sanctioned North Korean regime. impoverished Korean families to flee across the border and look for a better, more peaceful life within China. However, due to the Chinese intervention in the war, even there they were not entirely safe. That is, in an attempt to stall the Chines advance on the Korean peninsula the American (U.S.) Airforce regularly operated north of the border in Chinese airspace, bombing bridges, supply routes and supporting industry across Manchuria. In that period, the skies above the Yalu River and Tumen Rivers were known to pilots as MiG Alley. Many air battles were fought in the skies over Yanbian, with Korean and Chinese pilots (and later even Russians) flying Russian built Mig Fighters meeting American F-86 sabre aircraft in dogfights. As a result of this heated period in local history, the city of Yanji today is still home to a Chinese Airbase, which serves as aerial border-guards. Although American troops did come in view of the Yalu and Tumen Rivers in 1952, there were never any American (or U.N.) ground incursions into China or Yanbian. Realizing that China was a country far too large to occupy and hold, U.S. General D. McArthur, hero of WO II, proposed an all out nuclear offensive instead. He was immediately dismissed from his task by then President Truman who labeled the plans as both criminal and irresponsible, thereby averting a nuclear holocaust for these regions and many other parts of China (P.R.C.). A Schematic overview Map of Jilin Province entire delineating provincial borders and parts of neighboring Inner Mongolia AR in the West, HeilongJiang Province in the North, the Russian Primorsky Krai Maritime Province to the East, North Korea in the East and South-East and finally Liaoning Province in the South-West. 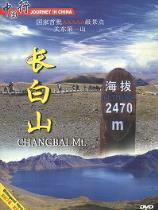 Map and description include Main Cities and Towns (shown by size), Main Monuments & Landmarks of Jilin Province, the Yanbian Korean Autonomous Prefecture on the borders with Russia and North Korea, Changbai Shan Naturese Reserve, Songhua Lake, Main Mountains (with Height), major highways, provincial railroads and main railroad-stations, and main waterways & rivers. This Map further provides links to on site photos and information on the Cities and Main Monuments. The rainy season brings out plenty of flowers and insects, whereas mud roads have many little ponds that offer refuge to the abundant frogs of Yanbian. (Photo: July 2010). been built throughout the regions. As mentioned, one can avoid lengthy travel - the regular train from Beijing to Yanji travels for about 17 hours) by flying directly into Yanji Chaoyangchuan Airport from Beijing Capital Airport, and several other destinations. Once in Yanji City once can go and explore the region. Due to the local geography the history of the Manchurian Railway, and with the special circumstance of Yanbian Prefecture being wedged between two Foreign Nations (formerly both with heavily militarized borders), most connections into Yanji City in the south of Yanbian Prefecture come from the West, and from the South. 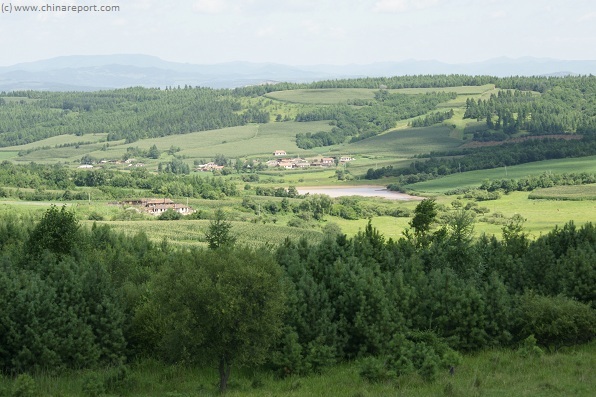 In the North the foothills of the Zygote-Alinn Mountains prevent easy access into Heilongjiang Province. From Yanji City itself, the main logistical point in the prefecture, roads directions have adapted themselves to nearby international borders, as well as the flow of local rivers and barriers of nearby mountains. In general that means that no main roads lead Eastward or Southward from Yanji, as this leads directly into North Korean territory. Instead, roads run south-south westward via Longjing, Helong and Shiping Towns in the direction of Zhengfeng Mountain as well as Northward to follow along the Tumen River. The first is the correct and only road to find your way from Yanji into Changbai Shan Mountain Reserve and a road that is often (partially) closed in winter due to massive snowfall. The latter is the connection to Tumen County level city and Hunchun County Level City, and Fanchang beyond, the most extreme eastern point of China and Yanbian Prefecture. The Northward road out of Yanji City has recently been upgraded into a multi-lane highway able to take large scale military transport movements. Following along the valley of the Tumen River, it splits off some 15 kilometers out of Yanji, where the Tumen River bends eastward shaping the border with the DPRK. Only several miles beyond, situated between fairly steep mountains lies the city of Tumen, altogether today a fairly modern town renowned for its border crossing. 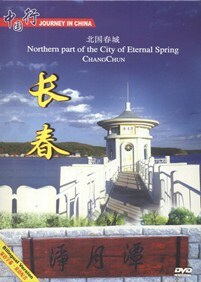 Travel from the central train and bus station in Tumen on Eastward to reach Hunchun and then Fangchuan beyond. It is not possible to reach the sea of Japan from Yanbian Prefecture, as both Russian and Korean territories lie between. The main provincial railway line travels first southward and then westward out of Yanji City, via Dunhua and Jilin along the main railway line to Changchun, the Capital of the Province. There are two other directions both of which follow along valleys of main rivers in the hilly and mountainous region. The northern line finds its way out of Yanji to connect to the fairly large industrial city of Mudanjiang in Heilongjiang Province with several stops at remotely situated towns within Yanbian Prefecture. From Yanji (Yeongil) it heads northward into the valley of the Tumen River. A few miles before reaching Tumen City it branches off into the Valley of the Gaya (mother earth) river and follow it upstream to pass west of Wangqing Town (zhen) and continue via Heavenly Bridge village (Tianqiaoling) to Chunyan village in the foothills of the Zygote-Alinn Mountains near the border with Heilongjiang Province. The second line follows the same route, but then branches eastward to Tumen city from where it leads to Hunchun and Fangchuan, the terminal station of this branch line wedged between Russian and North Korean territories. 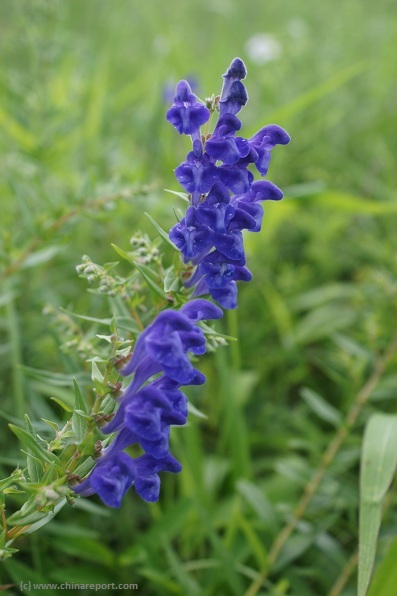 Amazing Blue flowers in the fields of Yanbian Prefecture. (Photo: July 2010). To the South-West lies the wild Changbai Shan mountain range ("the everwhite mountains"), China's largest wildlife reservation area. Immediatly to the South-East of Yanbian Prefecture lies the reclusive State of North Korea (D.P.R.K.). border rivers, the Yalu and the Tumen, spring. skiing at the new winter Ski Resort. thoroughly disadvized at all times. Instead, take the tour up to Heaven Lake and take the officially authorized view of the Lake and another empty patch of North Korea. South Korean visitors love to go see Paektu Shan, hike the Mountains and look over into North-Korea after which it is only natural for them to travel on to Yanbian Prefecture to visit the Korean Community and prepare for the next item on their travel itenerary, a trip westward to Tumen in order to have a look across the Border into North Korea from the Chinese side of the Tumen River. Follow along with a tour group (available in Yanji City) and get the standard but comfortable tour of it all. 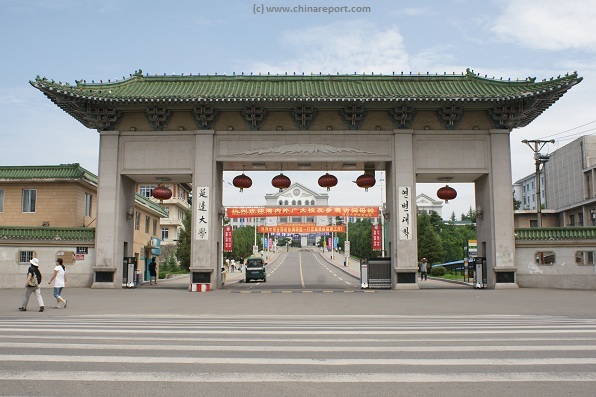 The Korean styled Main Gate of the Campus of Yanbian Korean University with its main building in the background. assimilation, emigration of Koreans to South Korea or their migration to large Chinese Cities, since long the South Korean Government and other organizations have attempted to invest large sums of money into the region in a bid to reinforce the Korean Business Community and the Korean Culture in Yanbian at large. As can be witnessed around the Town of Yanji, Korean business is everywhere in Yanji, and in the last 30 years Yanbian's economy has increasingly grown, riding piggy back first on the economic success of the South Korean State, and increasingly on the economic success of the Peoples Republic of China. As one can tell from a visit to the Yanbian (Korean) University Campus, or its website, the cream of the crop of Yanbian are solidly financed by both China (P.R.C.) and South Korea (R.O.K. ), and overseas ties to South Korea are regularly expressed through student exchange programs and visiting lecturers and the like. Furthermore, youthly citizens of the Yanbian Region often spend some years in South Korea, where they can get a working permit and Visa relatively easily. All in all more Nationalist South Korean organizations and groups keep a considerable effort going to keep the "Korean Spirit of Yanbian" alive and well. Other (South) Korean activities that may be glimpsed in the Yanbian Region are the widespread work of Christian activist, either from South Korea (R.O.K.) or more often even from the United States of America and the odd availability of Christian scriptures in unexpected places. Although, generally they keep a low profile the presence of new Christian Churches in Yanji and other surrounding Towns of Yanbian reveal their presence. Chinese Government to forcibly repatriate any North Koreans found to be in China illegally and a large detention center is currently operating in the growing Town (City officially) of Tumen. North Koreans who are sent back are usually punished harshly and sent to forced labor camps where many are said to perish. Their family members may usually join them there. Nevertheless, the refugees keep arriving while smugglers are said to travel up- and down frequently especially in summer when the volume and flow of the river is down. 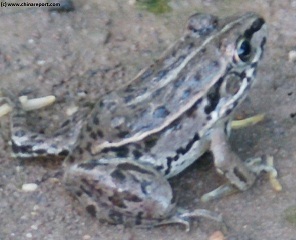 At times, people are found dead in the water of the river, either drowned or shot. The subject of the Korean refugees, their number, whereabouts and possible activities in China remains entirely undiscussed publicly in Yanbian Prefecture, which is why it remains an open question just how many North Korean citizens are currently hiding out on farms and in villages of Yanbian Prefecture. Western journalists and Christian groups in the West have reported on the abuse of Koreans and Korean women in China, however nothing else has come to light internationally. The only other frequent reports on Yanbian Korean Autonomous Prefecture come from the South Korean National Newspaper Choson Ilbo. In the summer of 2010 the prefecture, as did other regions in China, were struck by the most abundant rains in 60 years. Rivers broke their banks across the province and prefecture, wiping out many roads, destroying bridges and ruining crops and farms. The overall damage however was well managed and few deaths occurred. YouTube Video: "Escape from North Korea". BBC Short report on the refugee traffic in Yanbian and the North Korean Border. Although the creation of the Yanbian Korean Autonomous Prefecture has stablized the political situation in the region and across the border significantly since 1955 AD, meanwhile, for its historic reasons, the Yanbian Region and the issue of whether or not it is actually Korean remained simmering. As is now widely celebrated by the local Tourism industry, Goguryeo's fairy tale Maiden found her home at the Changbai Mountain, which for the Koreans implies that it is holy and must be returned to the Motherland. Strewn around in the Yanbian Prefecture but also on the other side of the border within North Korea (D.P.R.K.) are ruined remains of buildings of the Balhae Kingdom and Culture further reinforcing Korean involvement and claims to the regions. Although this is considered far less seriously, to further complicate things, the North Korean leadership specifically has (intentionally) further raised the stakes by creating a myth claim around the "fact" that its 2nd Communist leader, "General" Kim Il-Song was born on the mountain on the south side of it. Making use of the existing Korean founding tales, the North Korean Leadership so build much of its legitimization upon the "fact" of being native to the Changbai (Yanbian) Region and even today's ruling Elite in North Korea in 2013 would proudly call itself a "Manchurian Clan". In fact, it regularly makes mention of this link during (perceived) periods of outside threat. 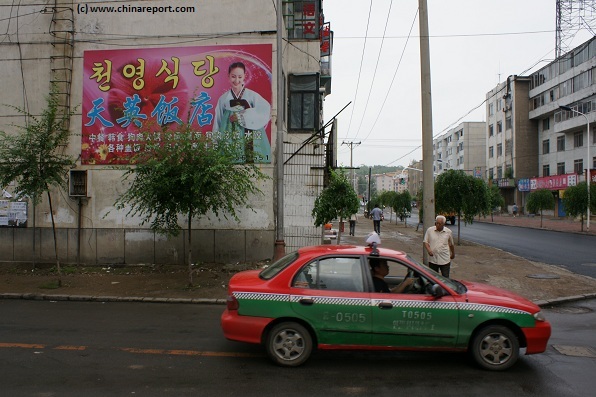 A flamboyant Korean advertizement on a backstreet of Yanji City, Korean Language first. A lady in Traditional Korean Dress shines radiantly but modestly to advertize some product. South Korean mouth-piece Choson Ilbo published the following: "The Chosun Ilbo reports that Chinese authorities might scrap the Yanbian Korean Autonomous Prefecture as the ethnic Korean population there drops to 33 percent. When the prefecture was first created in 1952, Koreans accounted for 62 percent of the population. But with ethnic Koreans in the region flocking to the big cities, where South Korean companies have set up shop, or emigrating to South Korea itself, Yanbian is gradually growing less Korean and more Chinese". Indeed, although as late as 2010 all shops signs in Yanbian were bilingual, outside of the Capital Yanji with the Korean Language first, by now in many if not almost all respects Yanbian is firmly in Chinese hands. The City of Yanji is growing into a Chinese style modern metropolis, and although Koreans remain abundant their number is increasingly dwarfed by that of the Han Chinese, who seem little or not concerned at all with the Korean aspects of local culture. It can well be said that the main aspect of Korean culture appreciated in Yanbian today are that of its cuisine, and perhaps its ancient bathing culture represented by the cities' multitude of "Bath Bouses" where one can linger in abundant warmth, steam and water. The Korean Prefecture has only 2.2 million inhabitants (the total population in Yanbian in 2008 was 2.185.500, of which 58.34% Chinese, 38.76% Korean, 2.9% other minorities) concentrated in six major population centres. These population centers are the city of Dunhua, followed by the Prefectural Capital City of Yanji (Yon'gil) counting 399 thousand citizens (and Yanji Chaoyangchuan Airport), and the towns of LongJing and Tumen , the latter somewhat famed for its bridge (the Tumen-Namyang bridge) and border-crossing into North-Korea. Other county level cities within the Yanbian Prefecture are even less well known than the already obscure towns of Dunhua, Helong and especially Antu where hardly any foreign tourist or other visitor may roam. As a last point may be mentioned the small city of Hunchun, which lies not far beyond Tumen underneath the south slope of the Selin Mountain of some 160.00 citizens. Less visited and less renowned as the crossing at Tumen, Hunchun is another Chinese town along the border river the Tumen and it can be reached by railroad and bus from Yanji, traveling via Tumen. The main rivers of Yanbian Prefecture are the Bu'Er Hatong River, the Tumen river, the Gaya River and the Hunchun River (珲春河). The Bu'Er Hatong River emerges in western Yanbian Prefecture near Dongdadingzi Mountain between Dunhua City and Antu. From there it flows south-eastward past Antu and on to Yanji City. Just beyond Yanji City the Bu'Er Hatong river is joined by the Hailan River ( at that point named Shuang He) from where the river flows north-eastward around Mount Chengli to follow a complicated winding trajectory through high hills before it merges with the Gaya River which, in turn, flows into the Tumen River some ways beyond at the north side of Tumen City. The Tumen River (Chinese: 图们江 ; Korean: 두만강 ; Mongolian: Түмэн гол) is internationally the most renowned of all rivers in Yanbian Prefecture. Finding its source on the slopes of the Changbai Mountain itself (just underneath the rim) the river has long been considered sacred and has since found a new meaning its notoriety as one of the two rivers that form the border between China (P.R.C.). and North Korea (D.P.R.K.). As with its southern counterpart, the Yalu, the Tumen is not merely a river or a border. Due to the nature of the society and regime on the other side of the border, the Tumen River has also become infamous as a death zone and an "end to the world". Virtually no one enters the land beyond it and illegal border crossings go at a high risk of total disappearance. Since the day Kim Yong Un came to power in North Korea standing shooting orders have been issued and corpses have piled up along the river banks. The Tumen River flows of the eastern flank of the snow capped Changbai Mountain, according to the North Korean's from their side of the border, to sweep eastward before describing a slow 90 degree arc heading northward towards Tumen City. At Tumen the combined waters of the Bu'Er Hatong and Gaya Rivers are added, turning the river eastward again to follow a path to the "East Sea" (Sea of Japan). Various towns and villages are found along the Tumen River. From source to sea the most interesting of these on the Chinese side are: Nanping, Kaishantun, Tumen and Hunchun. On the North Korean side of the river lie the towns of Musan (무산), Yuson and Hoeryong (회령) and Chongsong (Chongsong Workers District) of North Hamyong Province. Beyond Tumen lies the North Korean towns of Onsong (온성) and Saebyol (Today named Kyŏngwŏn and County). Many more villages dot the river on both sides. Technically, the Gaya River (流嘎呀河) is considered a mere branch of the Tumen River, a mere tributary. However as it has a considerable length and should be regarded as the main and only river in the north of Yanbian Prefecture, for all practical purposes the Gaya River is of considerable importance. The source of the Gaya River can be found in the foothills of the Sikhote-Alin Mountains which span the border between Yanbian Prefecture in the south and the Province of Heilongjiang in the North. From its source of Tazigou Village (north-east of Wangqing Town) and the Tazigou Forest Farm the river flows northward through what is almost exclusively forested land. Further on, the river makes a wide nearly 360 degree turn westward, to eventually flow back southward via Tianqiaoling (zhen) and Daxinggou (zhen) to end up at the County Town of Wangqing where it is joined by the smaller Wangqing River from the east. South of Wangqing Town the Gaya River winds it way to the Gaya River dam an its man-made Gaya Lake. As mentioned, the Gaya River is joined by the Bu'Er Hatong River before it empties into the Tumen River along the northern edge of the City of Tumen. Smaller rivers which have their source along the north rim of the Changbai Mountain range are the Gudong River, the Erdaobai River and the Hailan River. The Gudong River flows from the Laoling Mountain northward through Antu County. The Hailan River flows more eastward through Helong County and Longjing County to eventually combine with the Bu'ER Hatong River near Yanji City. 1895 and had as first and main article the giving up of Korea to Japanese Rule. That same year, Empress Myeongseong was assassinated by Japanese agents after which Japan used military means to force its way on the Korean Peninsula. As a result of the war raging on the Peninsula, and Japanese atrocities, a large stream of Korean refugees fled northward in advance of the invading Japanese, eventually ending up across the Yalu River and the Tumen River. In the years following many Koreans (Chaoxian) settled in Liaoning Province and Jilin Province, developing the land and eventually leading to a growing Korean enclave on what was then and still is Chinese soil. Today's Korean families in Yanbian often can trace their arrival in the region back to that period. Bringing along their own Korean culture and lifestyle, not only were the arriving Korean families the first to set up rice-farming in Yanbian prefecture and wider regions, they also set up guerilla bases from where the could operate across the border and fight against the Japanese occupation of the Korean Peninsula. The presence of these bases within Manchuria later led to growing Japanese incursions in China itself. 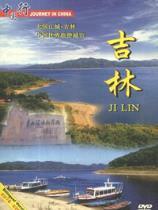 (Read more: history of Jilin Province). This Historic Map from the year 1905 AD gives a detailed overview of the Manchurian Regions in the triangle between the South Manchurian Railway (along which situated the Chinese cities of Harbin, Changchun, etc) and the Russian port of Vladivostok. For reference included in this Map are the main cities of the region marked in Colors to clarify the different nationalities and territories. Rivers, Mountains and other geographic features are marked where possible. Click through for more information on each location.